Tiny Houses: They are the new zeitgeist. Are you ready to move in? 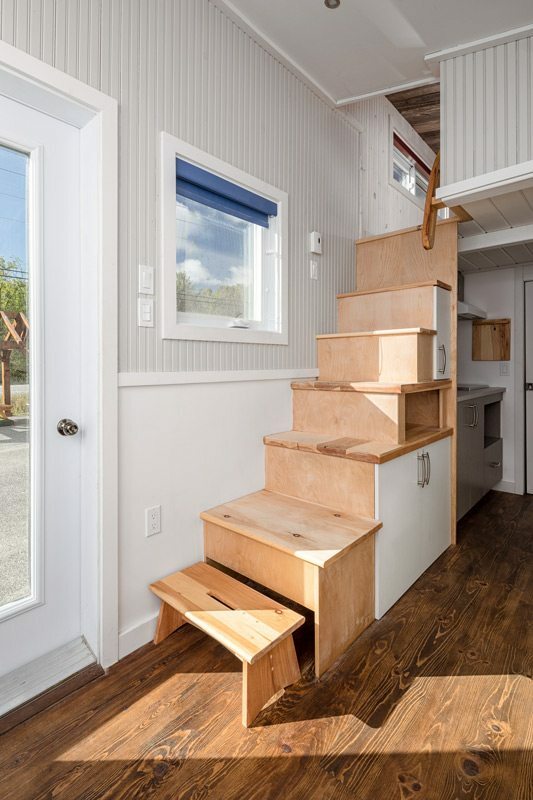 Winter was the driving force behind a Gatineau company’s foray into the tiny house market. Lumbec had been building sheds, decks, and gazebos since 1978. But when Martin Bisson bought the company in 2012, he started looking for ways to keep his workers employed in the off-season. 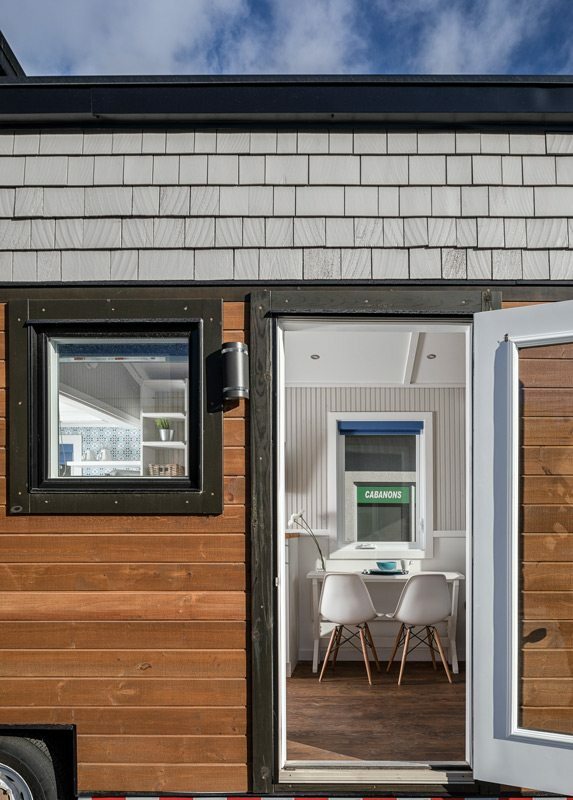 It wasn’t long before he tapped into the tiny house movement, experimenting with a 16-foot-long structure that staff began building in late 2014. “It was just a fun winter project at first,” says Nathalie Rodrigue, the company’s director general. 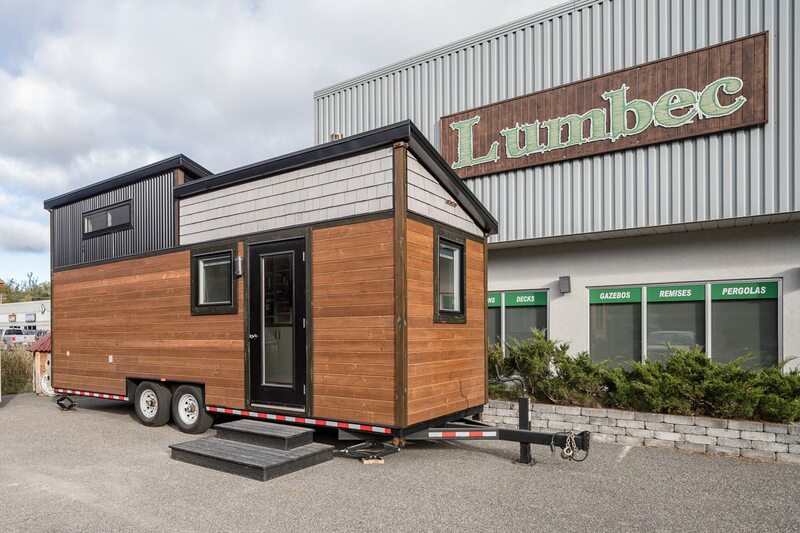 However, after the Ottawa Cottage and Backyard Show expressed interest in exhibiting the tiny house at its spring event in 2015, construction kicked into high gear. “When we spoke to them that January, we were at the beginning of the process. We didn’t know what we were doing!” Rodrigue recalls. But staff learned quickly. The prototype house was done in time for the show, and the resulting media attention was intense. 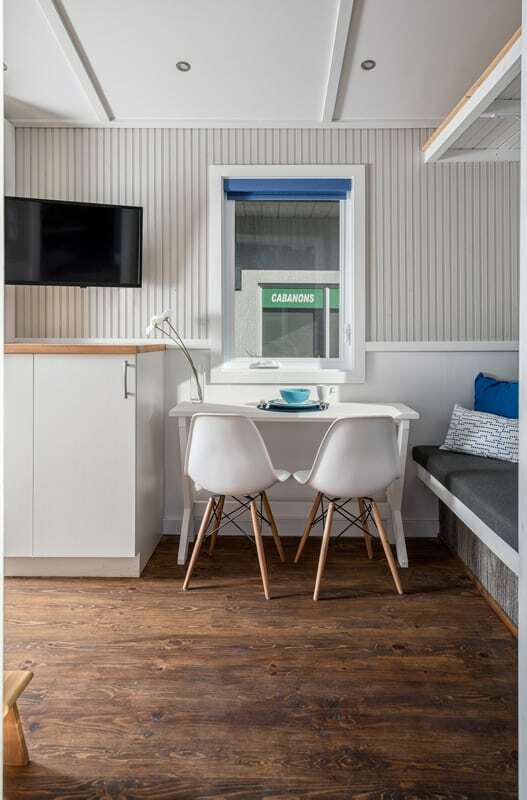 However, it took awhile for that publicity to translate into Lumbec’s first tiny home client, who commissioned a 24-foot-long house in late 2015. Unfortunately, after a year of living in a tiny house, the client experienced a change in circumstances; Lumbec agreed to sell it for her. The house is now on display at the company’s Pink Lake Road facility. If you have $70,000 plus taxes to spend — and somewhere to put it — it could be yours. For that 70 grand, you would get a 325-square-foot house fitted with clever furniture and appliances. “When we design the tiny houses, we always like to think about at least two functions per item,” Rodrigue says. A bench across one end of the eight-foot side of the house lifts up to reveal storage space. A multipurpose table — serving as desk, coffee table, or dining table, depending on the need — folds against the wall. Drawers are built into the steps up to the loft, which is large enough for a queen-sized bed on a low frame, as well as a pint-sized closet. The kitchen is surprisingly spacious, with lots of shelf and drawer space, a full-sized sink and refrigerator, two countertop elements, and a combination toaster/convection oven. “We always try to have a big kitchen,” says Rodrigue of Lumbec’s tiny houses. The ample counter space is particularly popular with prospective buyers. “People say, ‘Wow, there’s more counter than in my apartment, in my house,’ ” she notes with pride. One thing immediately clear is that this house was custom-designed for someone just a little over five feet tall. Since the shower enclosure was raised to provide storage space for a grey-water tank below, anyone taller than about five feet six inches would need to stoop to suds up. (On the bright side, the tub is a decent five feet long.) 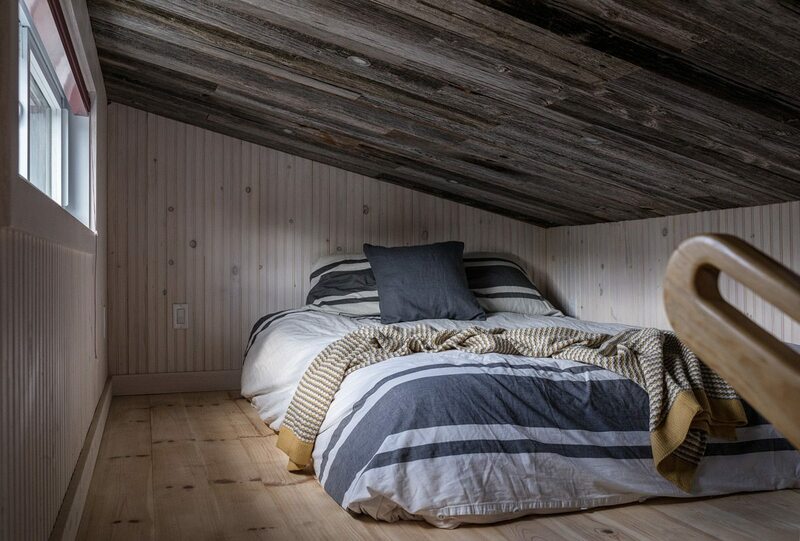 As well, the sloping ceiling in the loft means that anyone of any height would need to be careful when getting out of bed to avoid a bump on the head. 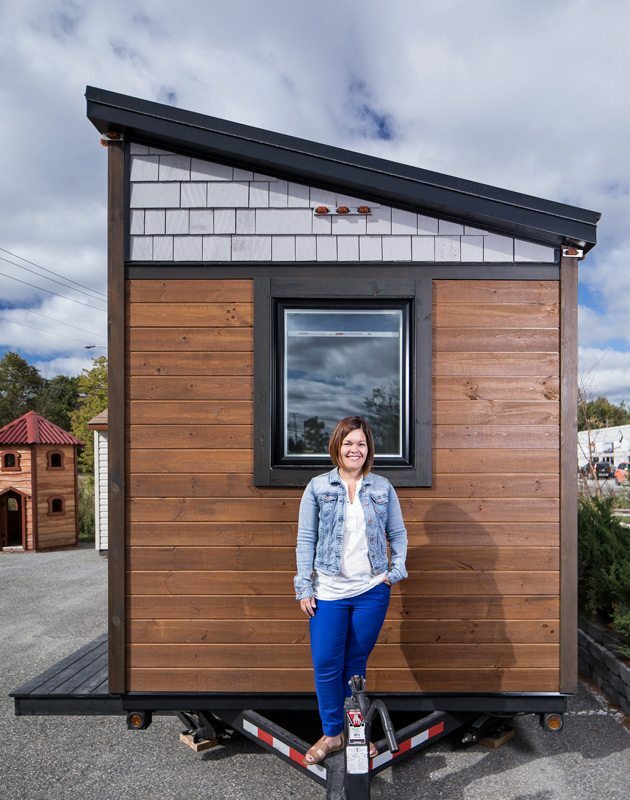 Rodrigue and her team have learned a lot about tiny house construction since 2014 and have met other enthusiasts along the way — they provided support to a project at Carleton University and have learned about technologies such as water and heating systems from an RV dealership nearby. Lumbec approached its first tiny house like a traditional build, framing it first and then installing plumbing and other systems. However, the team soon realized it had to do things in reverse, starting with the key mechanical elements and then building the framing around them. “Because it’s such a small space, you don’t have room to move in your grey-water tank or your clean-water tank after the walls go in,” Rodrigue explains.